As system requirements increase, the demands placed on passive components also continue to rise in an effort to meet ever-increasing consumer demands. Industry is demanding higher performance in smaller footprints at a lower cost. Current quadrature coupler offerings suffer from various drawbacks such as narrow bandwidth and limited selection in the case of GaAs-based products, poor repeatability for core- and wire-based products, and large size and leadless surface-mount package styles for other types. Mini-Circuits has developed series of high performance 3 dB quadrature couplers. 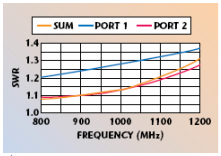 These products exhibit low insertion loss, amplitude unbalance and phase unbalance with good isolation covering the 800 to 2400 MHz frequency range. The finished part has an ultralow height of 0.05", measures 0.290 x 0.300" and is targeted for high performance coupler designs for moderate to high volume markets. The designs were accomplished using HP Momentum, a 2.5-D electromagnetic simulator that allows the designer to model complex physical structures with a high level of accuracy. Excellent performance was achieved with just one design iteration. The 3 dB quadrature couplers comprise a multilayer ceramic structure using processes and materials chosen for best electrical performance. Strict controls are placed on both the materials and the processes to ensure excellent performance repeatability from part to part. The use of ceramic material improves thermal dissipation and produces a hermetic structure, which results in excellent environmental ruggedness. The package consists of 10 leads welded to the substrate, forming a robust and reliable assembly. The leads are solder plated for good solderability. The model QBA-12 coupler operates from 800 to 1200 MHz, and its average insertion loss is typically less than 0.3 dB across the full band. Amplitude unbalance is 0.3 dB, with phase unbalance of 2° and isolation of 22 dB across the band. Figure 1 shows the QBA-12 coupler's insertion loss; Figures 2 and 3 show phase unbalance and amplitude unbalance, respectively. The unit's isolation and return loss performance are shown in Figures 4 and 5, respectively. The model QBA-12N coupler is specified to operate over the cellular bandwidth of 800 to 900 MHz and features typical performance of 0.25 dB insertion loss, 0.3 dB amplitude unbalance, 1° phase unbalance and 24 dB isolation. Performance is dependent on the quality of the printed circuit board used for the motherboard. High performance PCB materials with dielectric thickness of 30 mil or thinner and ground vias placed less than an eighth-wavelength apart should be employed. A recommended footprint is provided in the coupler's data sheet and can be downloaded from the respective model dashboard. Table 1 lists the coupler family's specifications. There are many applications that utilize 3 dB quadrature couplers, such as power combiners, balance amplifiers, variable attenuators, phase shifters, I/Q modulators and image reject mixers. The couplers offer low thermal resistance and an ability to operate at an elevated temperature due to their ceramic structure. The units also can operate with up to 50 W of input power, enabling their use in moderate to high power circuits. Power capability tests conducted indicate that each unit is capable of handling even greater power at room temperature. With 120 W of RF input power, the leads detached from the motherboard due to melting of the solder connection. After reattachment, the unit performed as before with no performance change noted. Continuous operation of the coupler at 50 W for a week indicated no performance degradation. A series of microwave high performance, surface-mount quadrature couplers have been presented, which offer good power handling in a small footprint. These couplers feature a very low height that is suitable for use in Personal Computer Memory Card International Association cards.